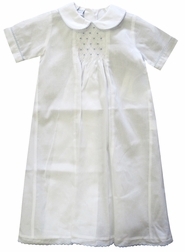 Home > Babies & Infants > Baby Clothing, Gowns & Layettes > INFANT BOYS > Baby Boy's Smocked White Day Gown With Blue Dots by Maria Elena. A beautiful white batiste gown embellished with blue gingham piping and smocked on the center chest. 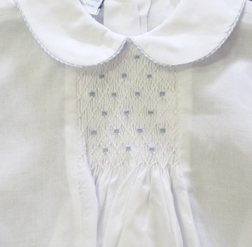 The smocking is embroidered with little blue dots. Perfect for a "coming home" outfit and for shower gifts.